Impress your guests with this delicious celebration cheese cake. To serve approximately 30 people. 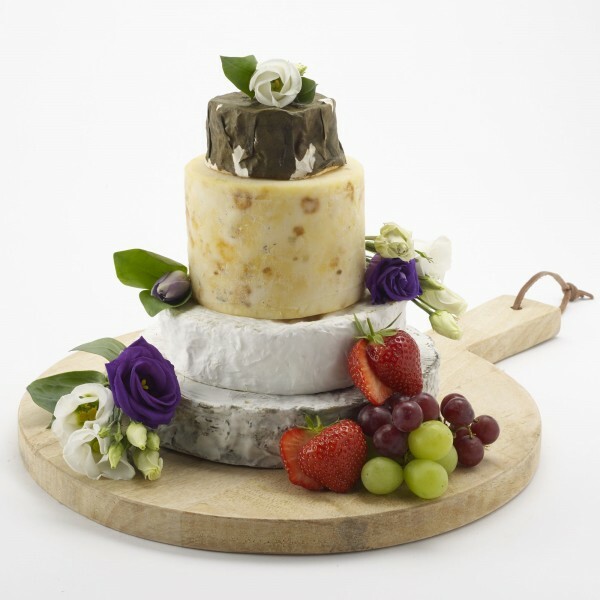 This Celebration Cheese Wedding Cake contains something to please everyone. To serve approximately 30 people. The diameter of the base cheese (Cote Hill Blue) is approximately 19cm. Eve 125g x2 - A soft bloomy rinded goat’s cheese, washed lightly with cider brandy and wrapped in a vine leaf. Cheddar Pounder PDO 550g - A miniature cheddar, cloth bound and matured in Somerset caves. Harder and nuttier than our full size cave-aged cheddar. Coulommiers 450g- Dating back as far as Brie de Meaux, this is a very traditional cheese. Coulommiers is a soft cheese with a bloomy rind which has a pronounced earthy smell. Cote Hill Blue 1kg- A creamy blue cheese made with unpasteurised milk to give a buttery and satisfying flavour. NB decorations and board not included.